Yesterday at 5pm, the Parliament passed a motion requesting the Scottish Government to bring forward a Good Food Nation Bill, which has the right to food at its heart, joins-up all aspects of food policy, and includes targets for areas of policy which impact on food. And this should happen within the next 12 months. The vote was tense, just a week after the Scottish Government published their Programme for Government – i.e. 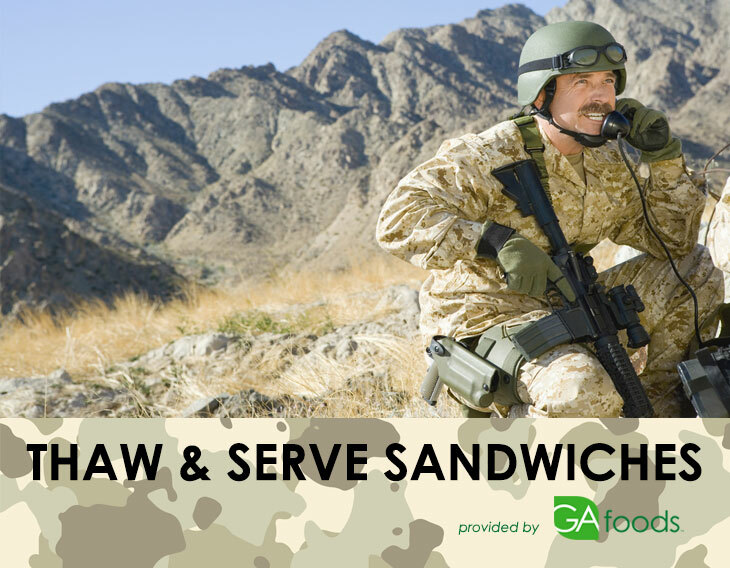 their work priorities for the next year – in which previous commitments to a joined-up Good Food Nation Bill were downgraded to a mere ‘Programme of Measures’. Yesterday’s result is a great success and wonderful reward for us at Nourish, our many partners in civil society, and everyone in Scotland who’s every talked about ‘Good Food Nation’. A few weeks ago, the Nourish staff and board members gathered for a strategy away day. One of the discussions we had, was about trying to summarise Nourish’s purpose in a verb. Do we ‘campaign’, ‘foster collaboration’, ‘enable change’… What is it, fundamentally, that we do? As we discussed, the emerging consensus was around: ‘at Nourish we change the conversations around food’. 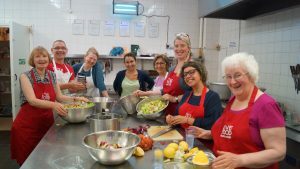 In the day to day, our work is very diverse: from building coalitions, to lobbying politicians, supporting local food businesses to thrive, engaging citizens with food system issues – but what brings all those strands of work together, is that each contributes to changing how people think and talk about food. Yesterday afternoon, the Scottish Parliament’s debating chamber was a fantastic example of shifting conversations on food. In a Scottish Government debate on ‘Celebrating Scotland’s food and drink successes’, MSPs of all opposition parties raised many of the important issues that surround our food system. While they acknowledged that Scotland has some great food and drink successes to celebrate, what dominated the debate, was the question: where is the Good Food Nation Bill? 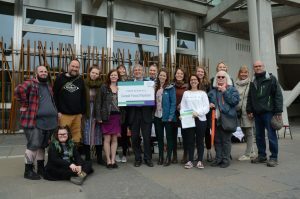 We heard some of the usual namechecks for MSPs’ local food businesses, with distilleries, breweries, and fine foods featuring front and centre, but there were also references to soil, animal welfare, antibiotics, biodiversity, climate change and the Sustainable Development Goals as well as food poverty, obesity, insecure working conditions and the right to food. In other words, and arguably for the first time in the life of the Scottish Parliament, there was a real debate about food. The motion which was voted on at the end of the debate included amendments from all parties calling on the Scottish Government to introduce a Good Food Nation Bill in the next year. 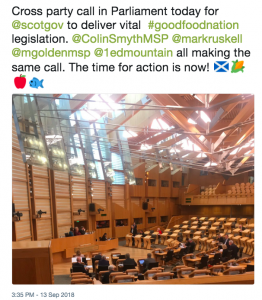 Most of the Scottish Food Coalition asks were included in the amended motion, meaning the Scottish Parliament as a whole has adopted our vision for the Good Food Nation Bill – joining up all areas touching on food, incorporating the right to food, and setting binding targets. So what next? The journey doesn’t end here. The Scottish Government will now be preparing a public consultation and will continue the dialogue with the Scottish Parliament to develop the draft Good Food Nation Bill. Will the Good Food Nation Bill solve everything? No. But it is a necessary part of the solution, and it is time to get on with it – that’s what all opposition parties told Cabinet Secretary Fergus Ewing MSP yesterday. 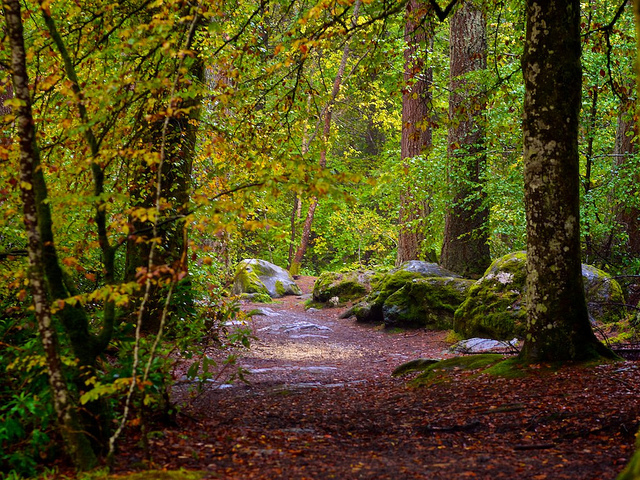 Nourish very much looks forward to working with them, and with our partners in the Scottish Food Coalition and beyond to ensure this Bill achieves its full potential. Our members are hugely important to our success. If you share our vision of what a healthy and sustainable food future looks like, please consider joining us as a member today. See the full motion, as amended (amendments are colour-coded by party). That the Parliament welcomes Scottish Food and Drink Fortnight and its campaign this year to encourage more people to buy, eat and promote Scottish food and drink and to champion the role that young people play in the sector’s success; notes that these aims are reflected in the vision of Scotland as a Good Food Nation; notes that legislation underpinning the Good Food Nation vision and ambition will be introduced in the current parliamentary session; agrees that this legislation should be broad-reaching and include measurable and time-bound targets for areas of policy on which food impacts, including health and wellbeing, environmental sustainability, local economic prosperity, resilient communities and fairness in the food chain, as well as new powers that the devolved institutions might receive as a result of exiting the EU, such as animal welfare, food standards, and public procurement; acknowledges the importance and value of the Scottish food and drink sector to the Scottish economy and the people of Scotland, particularly through the growth in sales within the UK and overseas since 2007; notes that, in 2017, food and drink exports to the EU were worth £2.5 billion; recognises the importance of geographical indicators to the Scottish food and drink sector; believes that any replacement scheme for geographical indicators must ensure at least an equivalent level of protection once the UK leaves the EU; acknowledges the innovative approach set out in the Good Food Nation policy document; believes that this needs to be underpinned by legislation to ensure that Scotland’s food policy maintains coherence and visibility over the long term within a framework of common principles, and consequently, regrets the omission of a Good Food Nation Bill from this year’s Programme for Government; calls on the Scottish Government to introduce such a Bill within the next 12 months; calls for a Good Food Nation Bill that has tackling food poverty and the right to food at its heart, ensuring a joined-up approach across government, local authorities, trade unions and public bodies to realise Scotland’s Good Food Nation ambition; recognises the reputation and quality of Scottish farmed salmon; notes however the published concerns of the Environment, Climate Change and Land Reform Committee regarding the environmental impact of salmon farming in Scotland, and agrees with its finding that the regulatory status quo is not an option.